Beyond the Kingdoms is a follow up to The Wishing Spell, The Enchantress Returns, and A Grimm Warning. The Land of Stories series stars many of our favorite fairy tale characters and their offspring. A fifth book hasn’t been announced, but the ending of this one gives readers the impression another one is on the way. The prologue opens with Hans Christian Anderson meeting up with the Fairy Godmother. The Fairy Godmother has two sons,’ John and Lloyd. She’s worried about her second son, Lloyd. Hans offers the idea of taking Lloyd into the stories he reads, so the Fairy Godmother uses magic to turn books into portals. Just when she thinks she has the gift to win her son back, she sees his truest desire in the Hall of Dreams and realizes she can’t save him, at all. Alex and Connor Bailey (the twins) are back. They continue to chase the Masked Man who raised an army and a dragon, and procured something very special, but dangerous in the wrong hands. The storyline starts off with the Masked Man trying to trap a coven of witches and blackmail them into a partnership and some popular Fairytale figures from the last three books in the series trying to sabotage it. This leads, once again, to action and adventure for the characters and pure entertainment for the readers. Alex the leader of the Emerald world is dethroned by the Fairy Council, which means chasing the Masked Man will be considered a crime. Alex and Connor know who the Masked Man is and are determined to find him. Before we witness them following the Masked Man to the Land of Oz, Neverland and Wonderland, we see Red Riding Hood suffer a wedding dress melt down; but her guests are the who’s who in the Fairytale world, including all the Charming Kings. Bree is close to discovering her magically family tree; and Alex’s wish to her late grandmother is finally answered as she witnesses one of her grandmother’s darker memories. There isn’t a lag or dull moment in the storyline. Beyond the Kingdoms is an extraordinary fantasy for tweeners and up. Fair warning, there are plenty of spoilers from past titles, and those popular fairytale characters have grown up – Goldilocks is pregnant and Red Riding Hood is getting married. 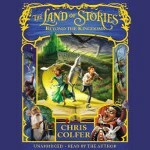 Author Chris Colfer is best known as Kurt Hummel on the TV show “Glee.” I’m not a follower of “Glee” and I don’t know Chris as an actor, however, after listening to Beyond the Kingdoms, I can say this young man has created a series to be remembered. Beyond the Kingdoms is a great story for both young and old, and the author is the perfect narrator for his series.